Growing up isn’t always the easiest thing in the world, and though most will turn to their teenage years as the time most deserving of their scorn for the terrible decisions they’ve made, I can’t help but think my childhood was where I made far more embarrassing mistakes. Case in point, for a few brief months of my life I wanted to be a magician. Thanks to a show on Sky where one wearing an awful mask revealed the secret behind some of the more dangerous or interesting stunts, I became fascinated with the world of magic and attempted to learn the craft, wisely stopping when it turned out I was probably the most hilariously inept conjurer of magic ever known. Looking back, part of me thinks that the reason I found myself drawn to Daedalic Entertainment’s The Night of the Rabbit was because it reminded me of a time when, like protagonist Jerry Hazelnut, I wanted nothing more than to be a magician, and I feel that if I’d played it back when I was younger then it would have been able to keep me under its spell. 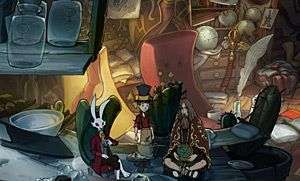 Taking place two days before the end of summer vacation, The Night of the Rabbit stars young Jeremiah Hazelnut, a twelve year old who dreams of nothing more than becoming a magician, and gets his wish granted when he meets the enigmatic anthropomorphic rabbit known as the Marquis de Hoto. Promising that Jerry will be back before dinner, the Marquis takes our hero to Mousewood so that he can become a Treewalker – a powerful conjurer capable of using the portals within trees to travel between different worlds. However, as Hazelnut learns new spells and becomes closer to achieving his goal, a threat begins to loom on the horizon that threatens to not only destroy the world of Mousewood, but his own too. 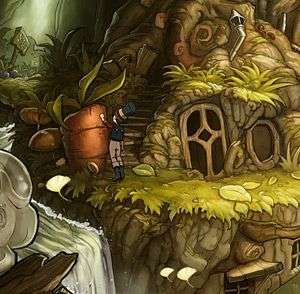 As the company that gave us both the Deponia and Edna & Harvey series, Daedalic should be known for providing a very unique visual take on everything they release, it shouldn’t come as a shock that their latest effort continues the tradition of bring something to the fore visually that few others can. Yet, it’s hard not to be consistently taken aback by how beautiful The Night of the Rabbit is. Every single locale that you’ll visit on the course of your adventure is like a piece of artwork come to life, full of so much incredible detail it’s hard not to find yourself delaying your journey just to take in the sights. There’s just so much love and affection crammed into every single still that it’s without a doubt the best-looking point and click I’ve ever had the pleasure of playing. I just wish as much attention had been paid to some of this title’s other elements. 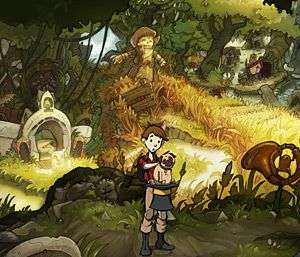 Allowances can be given considering Daedalic’s German heritage, but anyone who has played their previous titles will find that by and large a lot of the voice acting throughout Night of the Rabbit will bring to mind the dismal performances of A New Beginning before they do the likes of Deponia. Characters will often emphasise the wrong words, speak in completely the wrong intonation for the conversation or will flat-out sound like they’re reading off the script for the first time. Compounding this is that some of the worst performances are attached to characters you’ll be seeing far more of than you’d like as a result, a dangerous thing when one of the most problematic performances comes from the main character himself. At one point, I found myself having more fun guessing whether the next line would be a flub or well-delivered than I was actually listening, and during conversations between Jerry and characters like the Leprechaun – a particularly cruel combination of the worst performance and one of the most frequently appearing – I found myself just reading the text and clicking through so I didn’t have to actually hear anything. Quite simply, it feels like not nearly enough care was put into the voices this time around, and in a genre where dialogue comprises a vital portion of the action, the fact it caused me to start switching off is a worrying precedent. Conversely, nearly all of the voices attached to minor roles are closer to the stellar performances the genre is known for, with Churchmouse eventually becoming my favourite inhabitant of Mousewood through nothing but his Attenborough-reminiscent voice alone. It makes it all the more unfortunate that some of the most interesting denizens are given far less screen time than their more boring co-habitants, as more time with some of the quirkier citizens would only have improved my time in The Night of the Rabbit. Similarly, I’d have found myself far more settled if there wasn’t so much incessant repetition; some characters are given a set of lines that they utter at the end of certain dialogue choices – or at the end of every choice if you’re particularly unlucky – as well as when the conversation ends, and it’s undoubtedly the most baffling design choice I’ve seen in a point and click in a long while. Hearing the same thing spouted over and over just ends up discouraging extended conversations and forcing players to skip through the dialogue, and it gets so egregious at points that Ctrl+C and Ctrl+V should have been given additional writing credits. Despite the jibe, the writing is actually better than the aforementioned paragraphs insinuate, even if it doesn’t hit the highs of the rest of the genre, or indeed that of Daedalic’s flagship Deponia series. 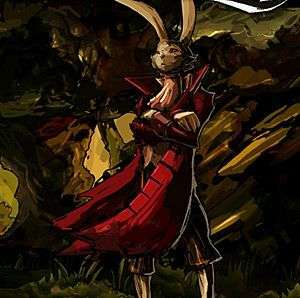 Those expecting a full-out comedy will come away disappointed though, as The Night of the Rabbit is more of a fantasy story, though there is a smattering of comic moments throughout, even if not all of them hit their mark. 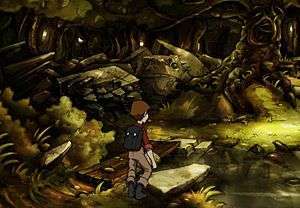 If anything, the best way to describe this adventure of a young boy who travels to a mystical world right by his home in order to fulfil his dream of becoming a magician is a children’s storybook come to life, and it’s a title that feels far more geared to younger audiences than it does older ones. The tone of the story and the beautiful landscapes make it perfect to introduce younger audiences to the genre, and throughout my time I found myself wish it was a title that existed back when I was making my first steps into the world of point and clicks. While the story is still better than the vast majority you’ll find in this industry and should be praised as such, it still comes with a few flaws that are worth discussing. For one, despite his presence being introduced at the start of the adventure and his billing as the big bad, all of Zaroff’s motivations aren’t revealed until a cut-scene after you’ve beaten him that triggers the end credits. You don’t even know why he’s evil or even what his plan was until you’ve defeated him! The titular Rabbit is barely in the plot, and there’s a whole plot thread involving him that I don’t recall being resolved, there’s a sub-plot involving crows early on that sets them up as the villains but gets dropped entirely until a brief scene meant to hammer in an environmental message – which itself is only addressed again during the ending for a brief scene involving a minor character for what came across more as a sequel hook – and the final scene is a sequel hook that could have been predicted, but doesn’t really make sense, nonetheless. One particular let-down is that throughout the adventure Jeremiah is forced to perform tasks that aren’t entirely morally scrupulous or cause him to feel openly guilty for his actions, but none of these moments ever come back to haunt him in a meaningful way or indeed at all, meaning that he just gets away with anything reprehensible. Though the story has its flaws, it’s still a very enjoyable romp that manages to surprise and deliver some particularly poignant emotional scenes, even if a couple can come across as a bit overwrought. Even Jeremiah’s journey has ended there’s still plenty of potential for the world of Mousewood, and if you’re looking for some additional depth then look no further than the special features, where nearly three hours worth of audio-books await you. Named “Eight Stories From Mousewood”, each audio-book tells another tale within the Night of the Rabbit universe, and serve as perfect bedtime story fodder for younger players. Regardless of their intended audience, they’re an amazing addition that builds the world in a way that I really wish other titles will pick up on in future and ranks as one of the greatest extra features I can think of. Also worthy of praise is the soundtrack, which is full of brilliant tunes that compliment the world beautifully and plenty that I found myself going out of my way to listen to and causing me to waste time just sitting and soaking the world in. The only issue I had was that the music is only contextual to your location rather than what’s going on in the story, and there was at least one scene that lost some of its intended impact as a result. All point and clicks arguably live or die based on their puzzles, and for the most part that Daedalic genius is alive and kicking in this title. There’s plenty of brilliant puzzles hidden within that will require plenty of cunning and logic to see through, though as with most titles in the genre there are the occasional moments where the solutions are slightly nonsensical, or would be the last thing you’d reasonably think of. It’s not a running trend, but there are occasional moments where you’ll likely use every item at your disposal before triggering the right solution and then ponder how you were supposed to figure that out. Some of these seem particularly mean-spirited when considering that The Night of the Rabbit repeatedly gives the impression that it’s aimed more towards younger players than others. What makes this issue even more apparent is the complete uselessness of the advice spell that Jerry is given early on, as it never gives you hints towards the puzzle you’re trying to solve but, instead, just relays the general end-goal of what you’re meant to be doing, rather than how to do it. This is doubly useless as the in-game journal also tells you what you’re meant to be doing and does a far better job of it; tracking all the tasks you’re currently trying to complete and reminding you of what happened previously if you forget or haven’t played in a while. The advice seeker isn’t the only useless spell, and despite Jerry being told he has to learn four other spells before he can finally become a Treewalker, the latter two spells are massively underutilised and are used twice each despite their amazing potential. Granted, the final spell is used to great effect in one of my favourite scenes in the entire story, but both that and the spell before it end up being disappointments, despite all of the potential puzzle opportunities that both presented. One of the earlier spells makes up for it by being used to solve some genuinely inventive puzzles, but had there been more balance then the spells would truly have set this title apart from the rest, instead of occasionally feeling like an afterthought. Where due thought and care has been put in is through the hotspot system; early on the Marquis de Hoto imbues Jerry’s lucky coin with magic, allowing him to see what objects can be interacted with through the use of magical iridescence. Tying this ability into the story isn’t the only brilliant touch, as some puzzles can only be solved by looking through the coin and revealing characters and objects that are otherwise hidden to the naked eye. It’s an inspired touch and one that opens the puzzle design to a whole new dimension, taking something oft-included in the genre but applying it in a way that makes it integral to the experience. Another excellent addition is the ability to fast-travel across Mousewood, though both of these are locked until certain puzzles are solved. The first lets Jerry travel from one end of Mousewood to another in the blink of an eye thanks to a secret Dwarf tunnel, though annoyingly this is only unlocked after a series of tasks that require a fair bit of travelling and backtracking, something that our hero himself points out once it’s revealed. The latter is far more useful, and allows young Hazelnut to travel to any location with the assistance of Plato the frog, who’ll take you there on his bike. Even if none of the tasks Jerry needs to accomplish need extensive travelling once you’ve got Plato on your side, it eases a lot of potential frustration and becomes a vital tool at your disposal. Though some may be put off by the collectibles present in The Night of the Rabbit, for the most part these all fit neatly into the world and essentially serve as a way to build it. 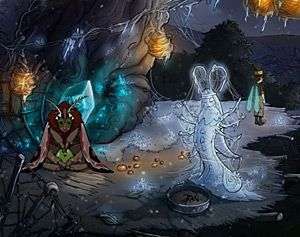 Among these collectibles are dewdrops hidden on certain screens that deliver some foreshadowing and which help contextualise a later revelation when they’ve all been collected, and the aforementioned Stories from Mousewood, given to you by a Woodsprite who is constantly searching for new tales to tell and Quartet cards. By using your cards on random citizens in Mousewood, you can at any point be transported into a mini-game called Quartets which, despite being a fun distraction, can be annoying and I found myself having to mute the action thanks to the endlessly repeating sound-bites giving a running commentary on how the match was going. While Quartets are a fun diversion, one of the story’s weak points comes from trying to justify them as more than a distraction by having them tie in directly to the main plot, despite the fact you could easily never play a single match and it have no effect on the story whatsoever. It’s not a perfect point and click, and there’s plenty to find fault with, but it’s still tough for me not to recommend The Night of the Rabbit. It’s a great take on the genre and a reminder that it doesn’t just have to be used for comedies or crime thrillers, and though the story is a bit muddled and the voice acting sometimes disappointing, it’s a great throwback to youth and provides a world that no other genre could pull off this convincingly. It toys with some mechanics in a way other point and clicks have never done before, and for that alone it’s a must-try for genre veterans. It’s a children’s story come to life, and though it may not be for everyone, those who come to Mousewood may find it hard to say goodbye. If I were younger, I’d regard it much more fondly than I do now, but try as it might, the curse of Zaroff is easier to break than you’d think. The Night of the Rabbit is a tough title to judge. It's astonishingly beautiful and often breathtaking, and the soundtrack compliments each locale excellently (even if it doesn't necessarily do so contextually). Not only that, but it's filled with plenty to do, quirky characters, a decent plot and some clever puzzles that push the boundaries by taking mechanics that are taken for granted and utilising them in an unique manner. On the other hand, the plot has a habit of picking up and dropping sub-plots with no rhyme or reason, the voice acting is lacklustre and some of the puzzles are on the wrong side of logical, which becomes particularly problematic when the hint system is useless and the sentiment I inferred was that children and young adults are the preferred audience. There's plenty to love, but I worry that the greatest parts are the most superficial, while those in greater need of improvement are the more vital elements. It's not going to stand tall in the upper echelons of the genre, but it'll be a title that I'll remember for a while to come, and one that I would easily recommend despite its flaws. If I ever end up having children of my own, it may be one of the first I use to introduce them to the realm of gaming. After Monkey Island, I mean.